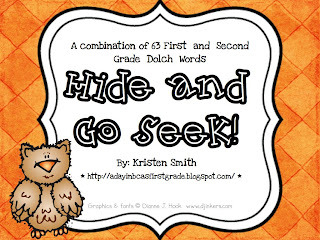 A Day in First Grade | Hide and go seek freebie! Hide and go seek freebie! Who doesn’t love a good game of hide and go seek?? I am all about using games in my classroom to make learning fun and I am so excited about this one. 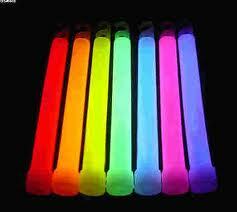 I went to Walmart the other day and stocked up on a bunch of really CHEAP glow sticks. I also made a quick packet of the sight words that my guys are currently struggling with practicing reading and spelling. On Monday before my kids go to specials, I am going to introduce the hide and go seek activity that we are going to do when they get back. I will put my kids into teams and then have them strategize how they can best find the most amount of words in 2 minutes. At this point I will set up all the ground rules* and build the excitement for our hide and go seek sight word game. After the kids get back from specials our room will be DARK and dimly lit by glow sticks and my lights around my board. Each student will be given a clipboard with their recording sheet on it and sit in the hallway in groups of two’s. Then, team by team, the groups will hunt for as many words as they can find in 2 minutes. While the other non hunting students are waiting in the hallway, they will be creating sticker stories in their journals. The team with the most words WINS. Also, students will get to share their sticker stories after the game as well. My kids are going to go WILD for this. *I am going to tell my kids in the hallway that if they are too loud or if they are not working on their sticker story, their team will get seconds taken away from their hunting time. If they had already hunted, they will get word deductions based on their infractions. I hope that you enjoy this freebie!! What fun! I am going to do this on Halloween day! Thanks so much for sharing! Kristen this is awesome!!! How creative! Thanks so much for sharing!